Stay tuned for upcoming events for Banana Boating in near future. 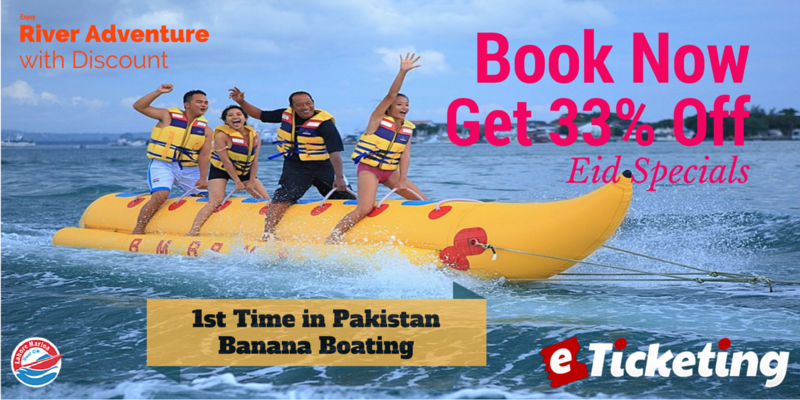 The Banana Boat ride could be the best ride for your buck on the Lahore Marina Boat Club. It delivers the thrill of a jet ski with a little more padding. The Banana Boat departs from the club point, goes a couple of miles down the coast, and then offshore to provide a spectacular view of the Head Baloki. The banana boat has often been underestimated, so hang on and enjoy the ride! The Banana Boat ride is definitely the activity you don’t want to miss out on. Jump on our inflatable boat and have more fun than you ever imagined. You will ride out Banana Boat. If you do, it’s not a problem as all riders are provided with life jackets and the boat captain will immediately pick you up and continue on this incredible ride. *Riders must be 4 years or older. Best Viewed at 1024 x 768 pixels and above. This Page loaded in 0.06847 seconds on Tue, Apr 23, 2019 (13:52).